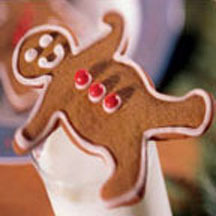 Fun to make and fun to eat, these gingerbread men won't last long because they're just too cute and yummy! In a medium bowl, whisk together flour, ginger, baking soda, salt, cinnamon and cloves. Set aside. In a mixing bowl, cream butter and sugar. Scrape bowl, add egg and molasses, and beat until smooth. Scrape down bowl and add reserved flour mixture. Blend on low speed until just combined. Do not over mix. Separate dough into 3 balls and flatten into disks. Place each disk in a re-closable plastic bag and remove excess air. Refrigerate 1 to 2 hours. On a floured surface, roll dough out to 1/4-inch thickness. Flour a gingerbread man cookie cutter and cut out dough with cutter. Place on a greased baking sheet about 1/2-inch apart. Gather scraps and re-roll dough until all is used. Bake 9 to 11 minutes in 350°F (175°) preheated oven. Transfer to a flat surface and cool. In a small bowl, combine powdered sugar and milk until smooth. Spoon icing into a pastry bag with a small round tip and decorate cookies as desired.